Princes In The Tower, costumed electro group offering unique interpretations of early music. 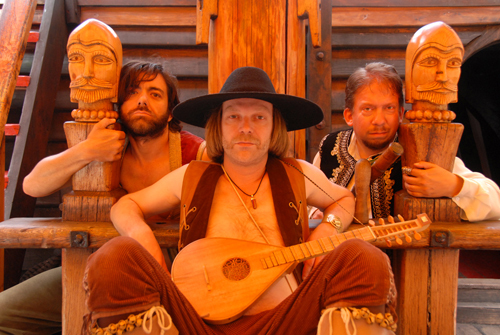 Good time band, this power-trio will get any Medieval party started! ROLLICKING GOOD-TIME PARTY BAND – bringing a rowdy peak to many a bash! Among these Daisy Lowe’s 21st and Julian Barratt’s birthday party. 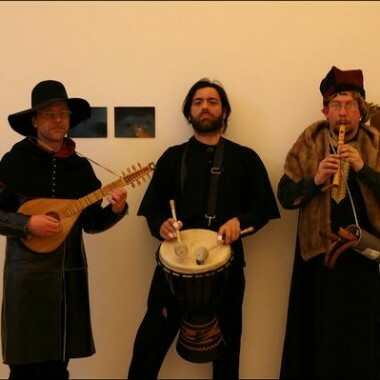 SCHOOL WORKSHOPS – Demonstrations of Medieval/Renaissance instruments in performance. Discussing the history of the songs performed and their relevance as a living, historical conduit to the past. Pupils write songs with the band to be performed at the end of the session. Often pupils take modern themes as inspiration for lyrics and graft them onto Tudor songs too. MUSICAL THEATRE – Working with pupils and drama facilitators to create a musical culminating in a performance and a DVD of the peformance to take home. 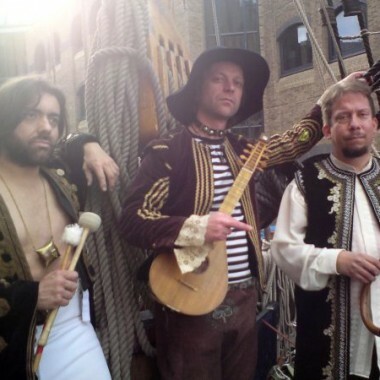 GOLDEN HINDE – Pirate Fun Days. 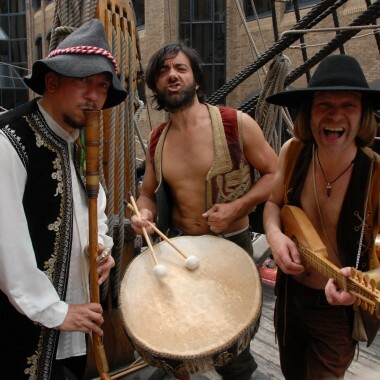 Songs of Tudor sea adventurers, privateers and pirates. Workshops with drama facilitators with the emphasis on learning through fun. All bobbing along on the infectious Princes In The Tower beat. Projects in 2009 included events marking 500th anniversary of Henry VIII’s ascension to the throne. Princes In The Tower appeared, in their augmented line-up, as ‘Circulus’ (once described as “the Spinal Tap of folk-rock”) at the British Museum in June 2009 to mark the historic occasion with performances of his own songs and enactments of scenarios depicting the king at important junctures in his life. The Princes have played at many cultural events in London and around the world. Working with performance artist Spartacus (Lali) Chetwynd in Milan, Miami and Rotterdam and a year-long collaboration with ‘The House of Fairy Tales’ culminating in the sell-out 2,000-seater Barbican event, ‘A Twisted Christmas’ in December 2009. During 2010 they are performing at Port Eliot Festival, Glastonbury, Thames Festival and Camp Bestival amongst others. Antony Elvin – vocals, big drum, little drum, tambourine, mouth cymbal.